Based on work first presented to widespread acclaim at the 2017 Asia Power Week in Bangkok, Thailand, the new white paper explores how reforms to Bangladesh’s power sector could unlock the country’s ‘remarkable renewable energy potential’. 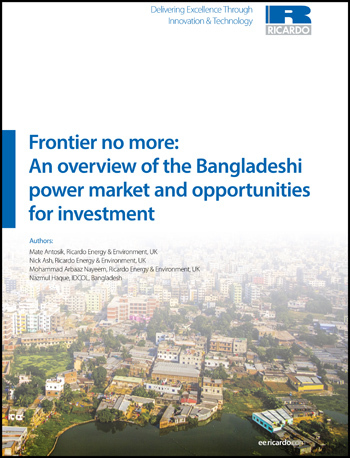 Entitled ‘Frontier no more: An overview of the Bangladeshi power market and opportunities for investment’ the white paper offers valuable insights to help investors better understand the Bangladeshi power market and the potential for renewable energy investment in that country. It also offers valuable lessons for other regions and markets facing similar challenges and opportunities. The white paper builds on Ricardo’s in-country work on the Capacity Building & Implementation Support for Power Sector Agencies (CBISP) programme. Funded by the European Investment Bank, CBISP is part of a $1.6 billion USD multi-tranche project designed to support Bangladesh’s expanding energy needs and build the capacity of government agencies in the Bangladesh Power Sector. Bangladesh has experienced a rapid increase in demand for energy over the past two decades. 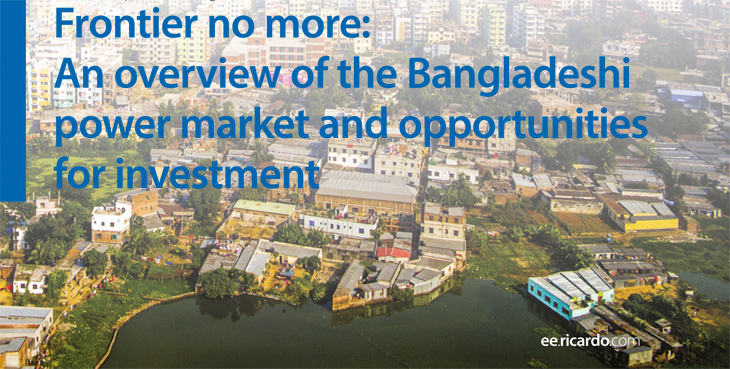 This trend is set to increase further as economic growth and development efforts accelerate in the attainment of the Bangladesh’s goal of becoming a middle-income country by 2021. Bangladesh’s renewable energy capacity is currently less than 3 percent in the generation mix. However, the Government of Bangladesh’s renewable energy policy envisages that 10 percent of the country’s total energy production will be generated by renewable sources by 2021. Grid-connected solar parks and wind farms are expected to play an important role in meeting this target, presenting an attractive opportunity for investors. Ricardo provides power sector planning services to governments, public sector organisations, utilities, private developers and investors throughout the world. It offers independent and unbiased market, technical and environmental advice to support clients implement bankable and sustainable power systems.